Last week, my tennis teacher had us practice with a foam ball. It moves much more slowly than a regular tennis ball. Having the time to watch the ball more closely gave my reflexes a chance to evolve with the practice. My backhand, in particular, improved substantially. The little innovation in my tennis instruction came on the heels of a professional colleague suggesting that as I look to build my business it’s important to go slow—slow at first in order to go fast over the long term. Going slow in order to go fast is also an underlying philosophy in interval training, or the increasingly popular run/walk approach to cardiovascular fitness. While the ultimate goal is to be able to run for a considerable amount of time or lengthy distance, you can start to get fit slowly, with a high ratio of time spent walking to that spent running. Injuries are reduced, and even less-fit people are able to stick with the program. Slow comes first; fast is achieved eventually. New learning is a balancing act. “If it begins to feel like you’re hungry and tired all the time, you feel like you need to give up the day job to learn this new skill, you should probably not be putting that much attention into learning a new skill….If you want to keep the day job, then it needs to be something that is attention intensive enough, that challenges you cognitively, and a little bit physically, but not that it’s so draining that you can’t actually do the other things that you need to do.” Over time our efforts to learn carve new neural pathways in the brain, a kind of gray-matter muscle memory; we become speedier at our new skill without compromising our ability to perform other mental tasks. Learning something new requires practice, and practice takes time. It’s at least as important to get things right as it is to get them fast. So slow down. You may be moving too fast. Speaking of slowing down, we have two podcast guests who are definitely worth taking the time for. 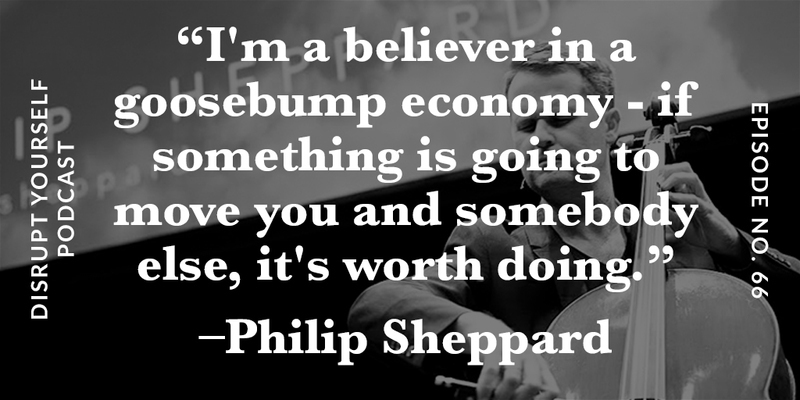 The first is Philip Sheppard, a cellist and composer who I first met at the Business Innovation Factory (BIF) Summit in 2017. We have a fascinating conversation about creativity, following your passion and business. 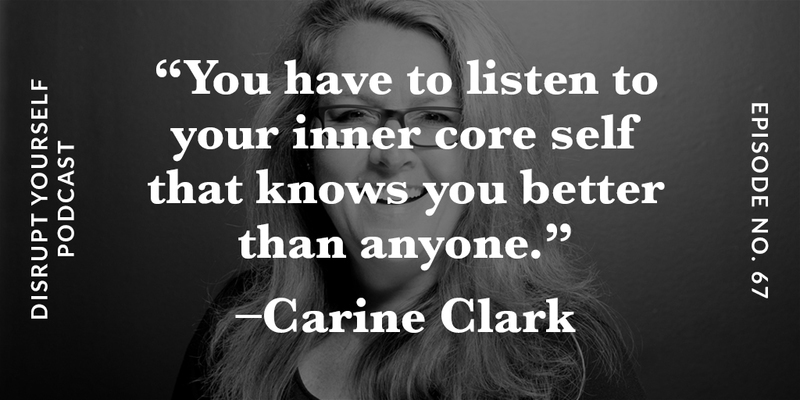 The second is Carine Clark, a three-time CEO, and serial disruptor who I first wrote about in Disrupt Yourself. This is a person who is willing to go slow to go fast, to step back to grow, or as she likes to say–she’s willing to lose in order to win. Finally, if you heard our live coaching episode last week with Michelle Seymour Smith, you may have heard me say that we are offering another opportunity to be coached by me – free of charge – if you’re willing to have our coaching sessions aired on the podcast. If selected, you’ll have the opportunity to take both of my diagnostics (the S-Curve Locator and the Disruptive Strengths Indicator) and complete two coaching sessions with me, an initial session, and then a follow-up session 6-8 weeks later. If you’re interested, please hit reply to this email and tell me a little about who you are, what you do, and how you think a coaching session together would be of help to you. Thought provoking questions to spark conversations! What areas in your life do you need to slow down? Click here to comment and start a respectful discussion! The homeless man who needs a meal, who needs to be acknowledged. The person who feels invisible that you bring into existence. Doing the right thing at the right moment. These are examples of Blue Courage Moments. Watch this short video to find out what a Blue Courage moment is and how Blue Courage Moments propel our society in a positive direction, adding to the legacy we leave behind. Great leaders move us. They ignite our passion and inspire the best in us. When we try to explain why they are so effective, we speak of strategy, vision, or powerful ideas. But the reality is much more primal: Great leadership works through the emotions. Humankind’s original leaders earned their place because their leadership was emotionally compelling. In the modern organization this primordial emotional task remains. Leaders must drive the collective emotions in a positive direction and clear the smog created by toxic emotions whether it is on the shop floor or in the boardroom. When leaders drive emotions positively they bring out everyone’s best. When they drive emotions negatively they spawn dissonance, undermining the emotional foundations that let people shine. The key to making primal leadership work to everyone’s advantage lies in the leadership competencies of emotional intelligence; how leaders handle themselves and their relationships. Leaders who exercise primal leadership drive the emotions of those they lead in the right direction. Understanding what primal leadership is and why, when practiced correctly, it creates resonance in your organization. Understanding the neuroanatomy that underlies primal leadership and what emotional intelligence competencies you need to succeed. Understanding who you are and what you need to change to become a primal leader, and then develop a plan to make those changes. Learning how to build emotionally intelligent organizations. To purchase this book, click here. Each month, we will present information and recommendations that could effectively enhance your way of thinking, behaving, and feeling. August happens to be National Sales Enablement Month….and it doesn’t have to be scary! Selling doesn’t have to refer to a product or a service – it can also be an idea or a way of thinking that you want others to listen to or adapt to. When you are passionate about your work, you sell every day just by speaking to others about what you do. Stories sell! When you bring in a personal story about how this product, service, or idea has enhanced your world….it’s instant validation as to why someone else should buy in. Know your audience. You are asking for instant failure if you trying to sell cat toys to someone who is allergic to cats – or trying to convince someone to join a hip hop dance team who has had two knee replacements. In this day and age, there is even more access to a wider audience through social media, mass email tools, and internet access to research at your fingertips. Here is a few of our favorite suggested books to give you a few pointers if the whole idea of “sales” still makes you want to run! Do you have a story that you would like to share? Contact us, we’d love to hear from you! You could be featured in future Illuminate issues!